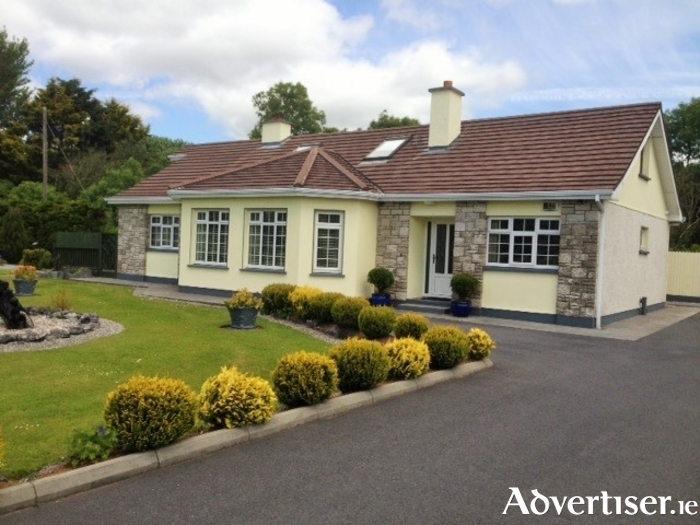 This magnificent bungalow at Coolough Road, Menlo, offers a superb opportunity to acquire a magnificent detached home on a half acre site just over one mile from Galway city centre. This beautiful home is in pristine decorative order and repair. It has been refurbished and extended to provide a family home of distinction. Accommodation includes an entrance hall, hallway, lounge room, kitchen/breakfast room, utility room, and downstairs toilet. There are four double bedrooms, a main family bathroom, and a large converted attic area offering two further bedrooms and a toilet. There is a large forecourt to the front with ample parking. This property must be viewed to be appreciated. Viewing is highly recommended and guaranteed not to disappoint. The BER is D1. Asking price is €495,000. For further details contact Colm O’Donnellan or Kyle O’Brien at O’Donnellan & Joyce, phone 091 564212.